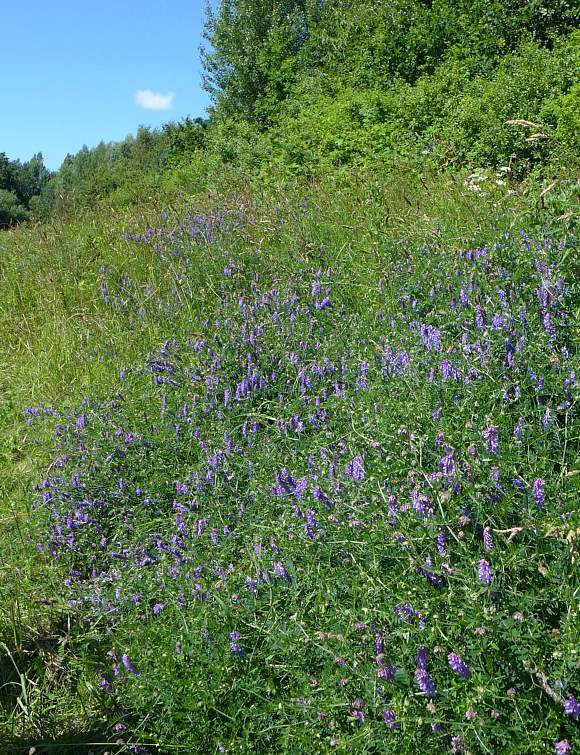 A sprawling rift of Tufted Vetch. 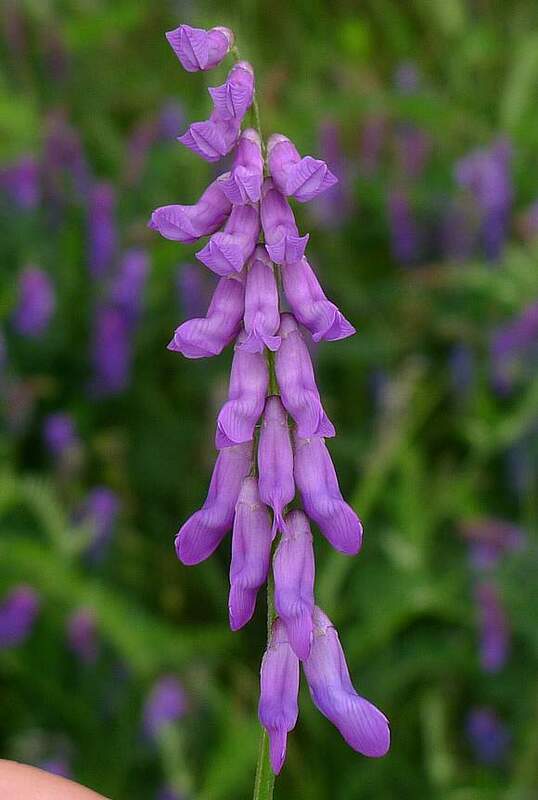 Tufted Vetch can climb sprawlingly up to 2 metres high. And always has a straggly appearance. 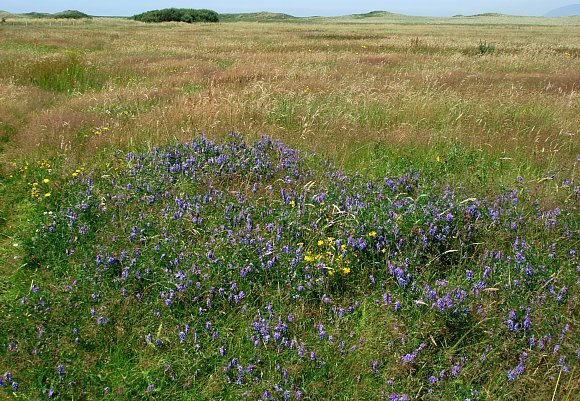 The narrowish leaves are in 8 - 12 upwardly-angled opposite pairs. 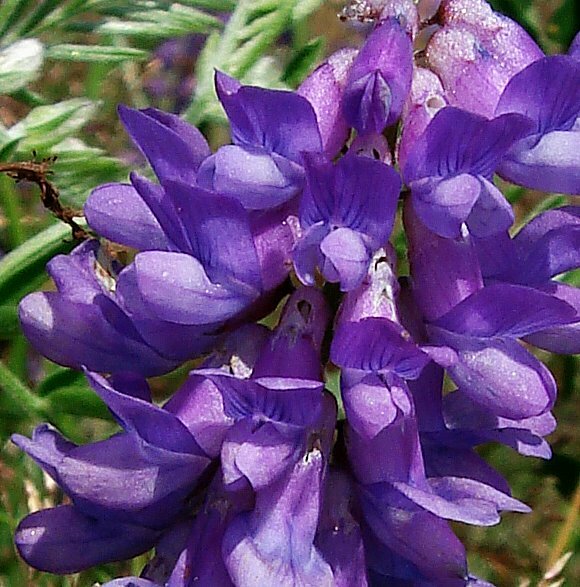 The purple/mauve flowers with the standard roughly as long as the claw. They rarely open wide enough to see the innards properly. 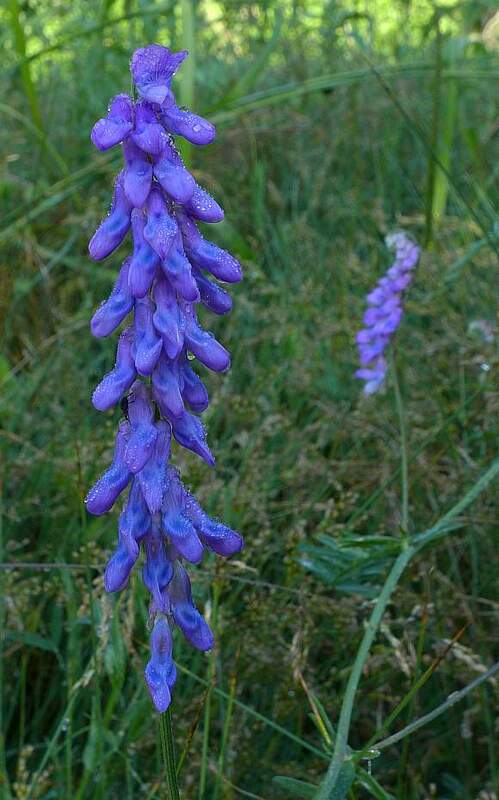 Apart from the uppermost, the flowers are in adjacent pairs, all on the same side of the stem. 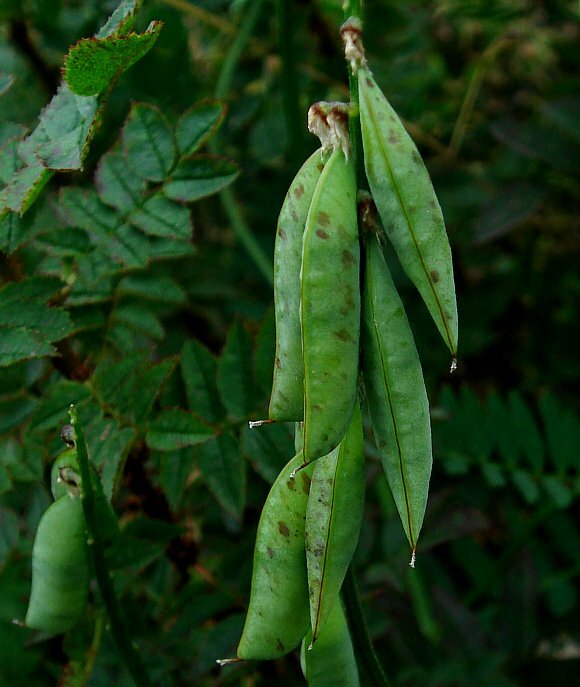 The hairlessseed pods eventually turn brown. The climbing tendrils are paired up. 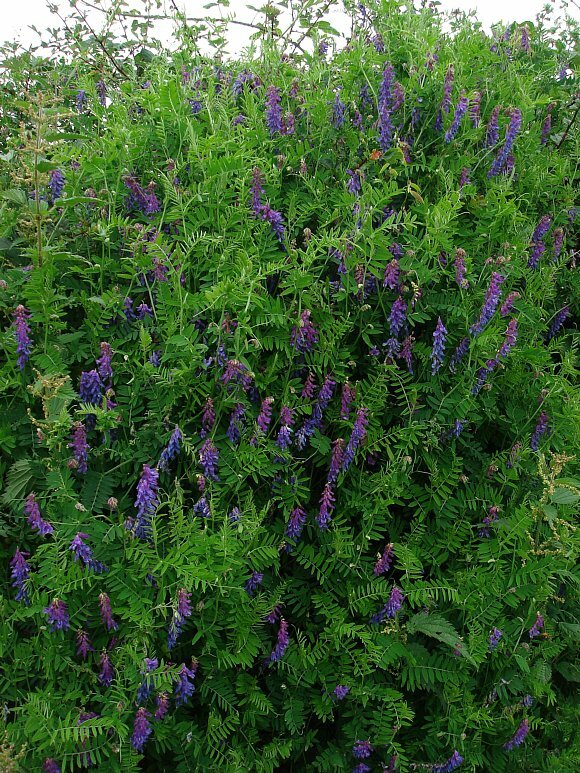 Occcupies and clambers up and spreads through vegetation up to 4 feet but hesitates in denser shrubs where light levels are much poorer. Likes to sunbathe..
Will scramble much higher (here about 9 feet) providing it can get enough sun, which it can here on both sides of a metal mesh fence. 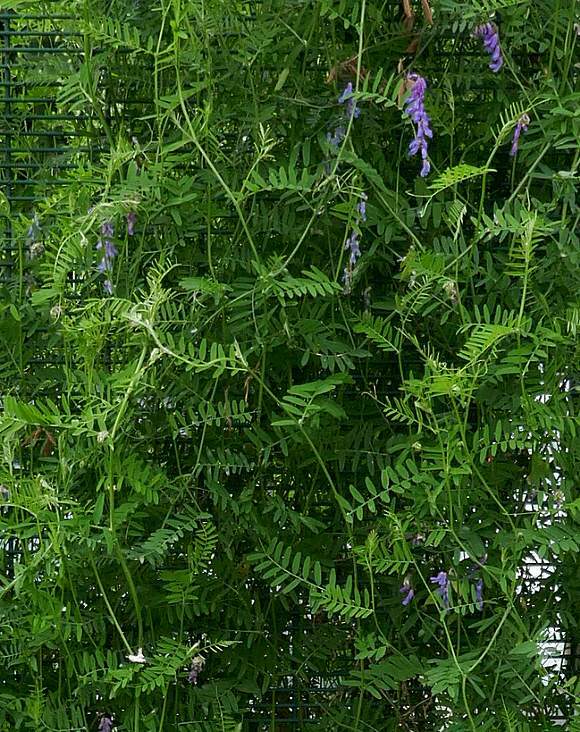 Fewer flowers here allow one to see the leaves and their climbing tendrils properly. A rather long specimen. 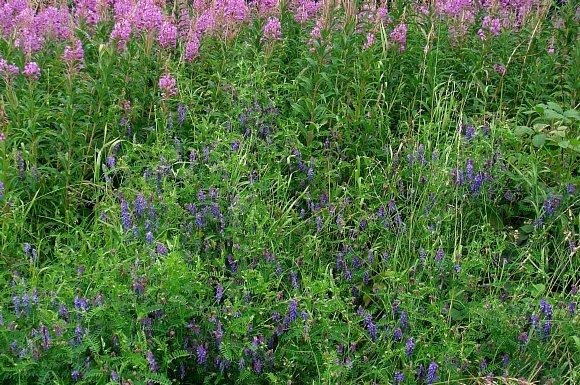 Flowers can be deep blue or purple-pink, but usually both at the same time. 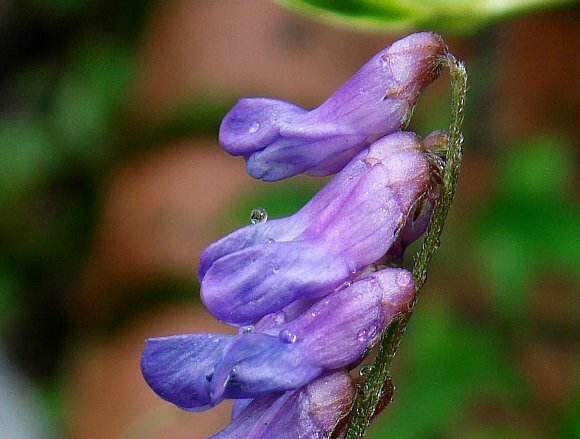 Evaporating rain drops on inflorescence. They don't like showing their backsides. 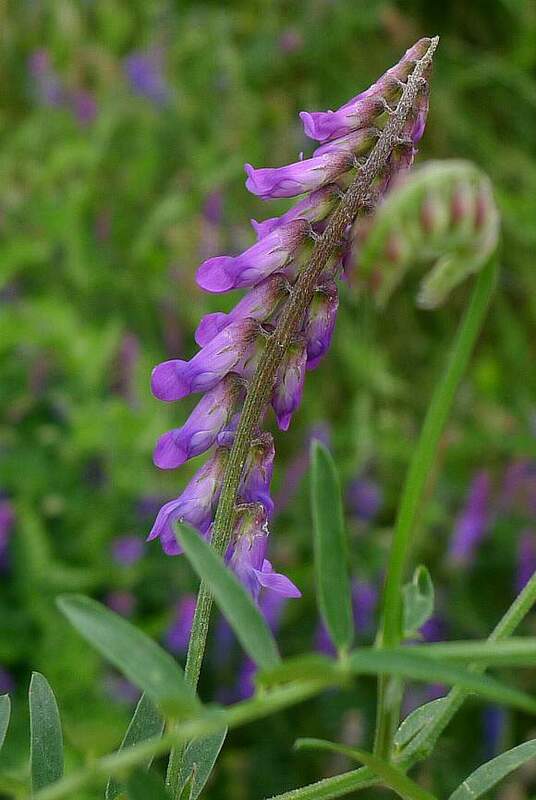 Stems slightly ribbed/striated and with very short hairs. 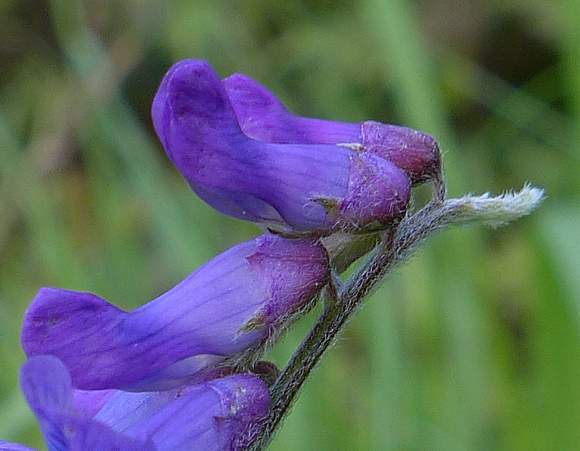 The sepal cups are very short, their teeth shorter at the top but much longer underneath to support the flower. Stems with short hairs, this specimen with a hairy tail at the termination. 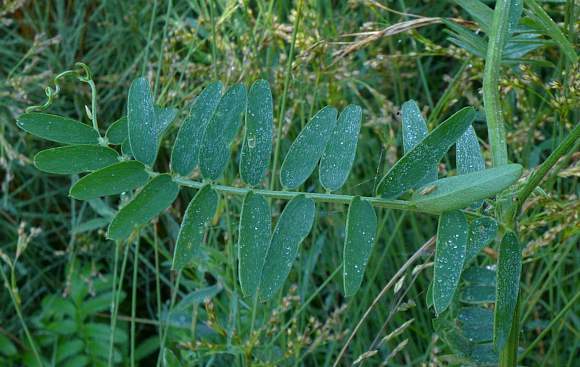 The leaf consists of a rachis (stem) supporting between 8 to 12 somewhat haphazardly-paired leaflets. Leaflets slightly shorter near the end of the rachis. Leaflets extended oval, slightly broader nearer the supporting rachis (stem), haphazardly opposite (or so). 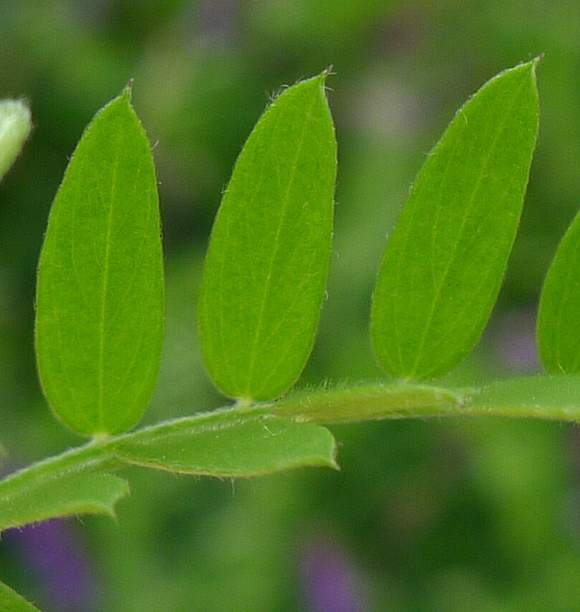 The leaflets are on very short petioles (stalks) and have a short acuminate point at the end, which is slightly asymmetrically set. 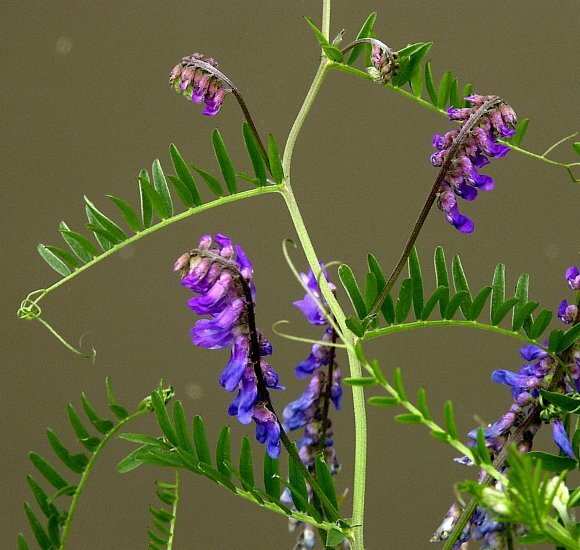 Some similarities to : Fine-leaved Vetch (Vicia tenuifolia) and to Fodder Vetch (Vicia villosa), but both of these are much less frequent in the UK occurring in only a few places, unlike Tufted Vetch which is almost ubiquitous throughout. 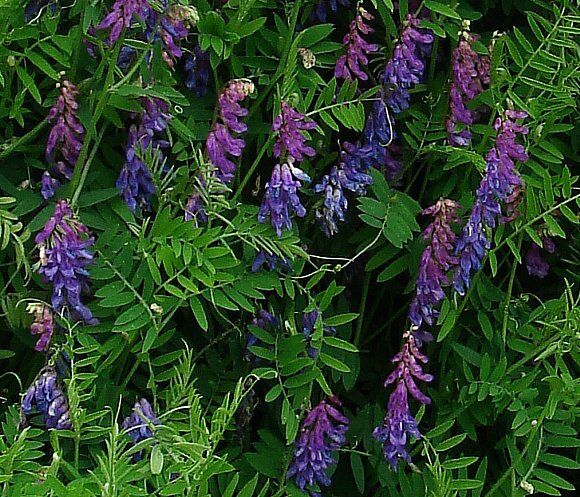 Fodder Vetch is an introduced annual species quite rare apart from around London with larger flowers (10-20mm) which are a similar blue colour and the narrow 'stem' of the banner petal is twice as long (not roughly equal as in Tufted Vetch). 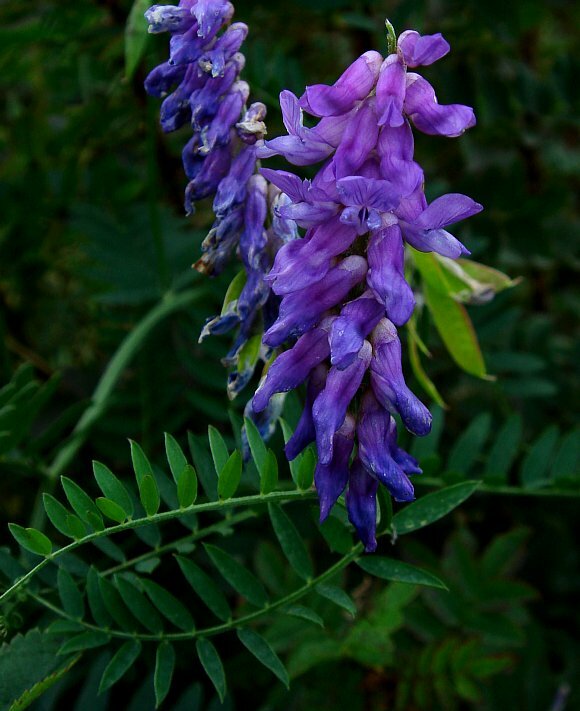 Fine-leaved Vetch is more of a bluish-lilac to purple colour, rarer than Fodder Vetch and might just only be a sub-species of Tufted Vetch (? ).